Gnarly branches intertwine high above us. The dark brown branches show their age through their many wrinkly knots. These mighty giants have stood proudly for over a century. The beech trees on Bregagh Road are known as the Dark Hedges. The ethereal tunnel of trees was featured in the TV fantasy drama, Game of Thrones, and since then they have formed an essential stop on the perfect Northern Ireland road trip. Their popularity, however, can make it difficult to avoid the crowds. 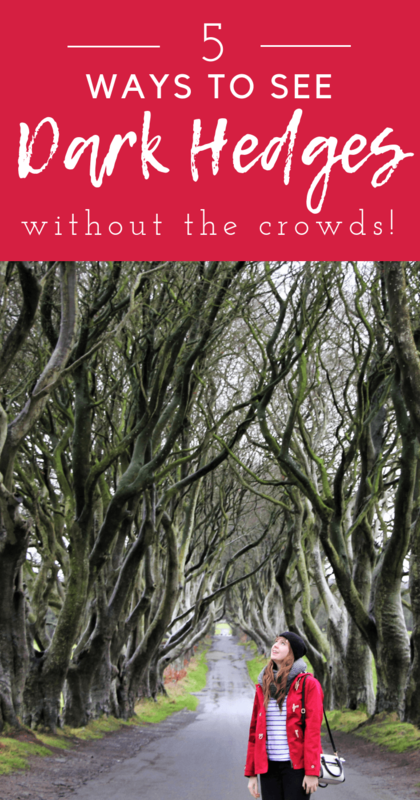 Yet there are a few ways to see the Dark Hedges without the crowds. Here are 5 tips on how to take incredible photos of the Dark Hedges, without the crowds. 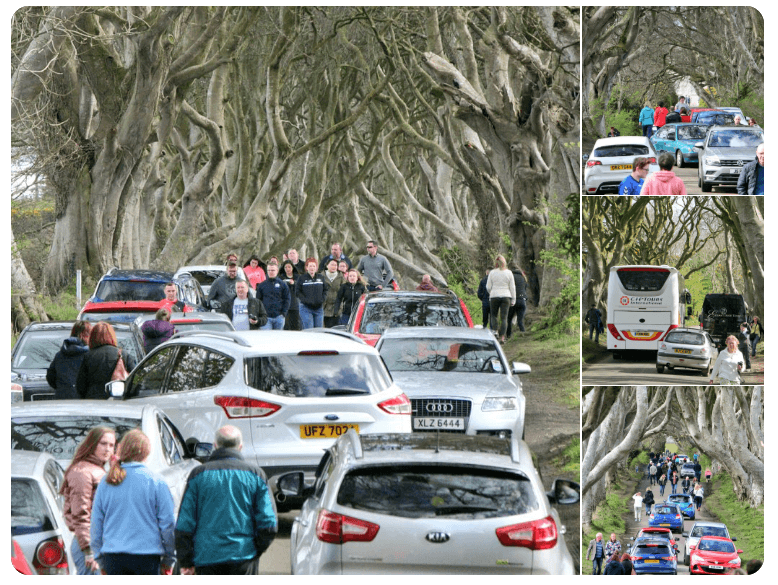 Since the Dark Hedges appeared in Game of Thrones, the number of visitors the old trees receive has sky rocketed. Weekends, summer holidays and bank holidays can see hundreds of people all flocking to the arched road to take that perfect Instagram picture. Yet the crowds can make it difficult for visitors to capture that image. Recently, the local government made changes to stop traffic from entering the road. That means that images such as below are luckily now a thing of the past. Now you just need to time your visit right to avoid the people traffic at the Dark Hedges. I recently went on a fantastic weekend break to Belfast in Northern Ireland with my very good friend Rachael. On our first day we wanted to visit the Giant’s causeway and a few other places along the Northern Irish coastline. One of those stops would be the Dark Hedges. There are a few ways to get to the Dark Hedges. In terms of modes of transport, you have the choice of public transport, guided tour coach or a hire car. Public transport will be the slowest option meaning the coach or car is the best choice for having a chance of beating the crowds to the Dark Hedges. You could join a guided tour. There are several guided tours available from Belfast. Yet whilst these tours take away the anxiety of planning and allow you to enjoy a trip to the distillery, they make it harder to get that perfect shot. Imagine you are on a bus full of 30 other people. That means that at least 31 people will all be at the same place at the same time. Unless you happen to sit at the front and run ahead as soon as the bus stops, 30 other people will also be trying to take photos. The sheer amount of people can make it hard to take a photo without anyone else in it. Also imagine if your coach turns up at the same time as another coach. Additionally, you will be on a tight schedule meaning you may not be able to wait for the crowds to leave as you’ll be ushered back onto your tour bus. To avoid the people traffic I recommend hiring a car. If there are two of you, the price of car rental, insurance and petrol will be about the same as two tour guide tickets. Hiring a car gives you ultimate flexibility enabling the best chances of taking photos of the Dark Hedges without crowds. 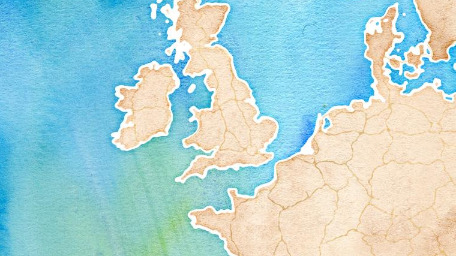 We hired a car and embarked on the ultimate Northern Ireland road trip. Sometimes you cannot choose the day you visit a particular site but if you can, visit the Dark Hedges on a week day. It had been recommended to us to visit the Dark Hedges on the Friday to avoid the weekend crowds. We heeded the advice and planned our itinerary accordingly. We would spend the Friday driving to the Northern Irish coastline, spend time learning about the Troubles on the Saturday and explore Titanic’s past on the Sunday. On our first day in Northern Ireland we left the city of Belfast and headed out into the beautiful Northern Irish countryside. We arrived at the Dark Hedges on a weekday. There was no one else here! We left Belfast around 9am and it took just over an hour to reach the Dark Hedges. You can either take the most direct route or the coastal roads. The coastal roads are very pretty but take much longer. We decided to take the direct route along the motorway and save the coastal route for later in the day. After filling in the paper work for the car we left the city at as quickly as we could. The route to the Dark Hedges is fairly straight forward although my map reading was not the best meaning we made a couple of wrong turns! We arrived at the Dark Hedges just after 10am. There were no crowds! Nobody was there. We parked up our hire car and walked down the Bregagh Road. Arriving early at the Dark Hedges meant we had the beautiful tunnel of beech trees entirely to ourselves. Naturally we took quite a few photos to make the most of our fantastic timing. Just as we were leaving the Dark Hedges, a tour bus pulled up. Out poured dozens of tourists, all ready with their cameras. We smiled as we had just missed the crowds by arriving early at the Dark Hedges. If, however, you do arrive as early as you can at the Dark Hedges, but many others are already snapping away do not despair. There are a few tricks you can use to get your perfect shot. If there are figures in the background, you can position yourself carefully to block them out. Similarly, the dips in the road mean you can sometimes time it, so that the figures are hidden by the dip. Alternatively, as many tourists do not stay very long at the Dark Hedges you can just wait for the road to clear. The tour buses tend to stay for about 10-20 minutes. Solo travellers in cars will also not stay too long as once you have taken a few pictures and read the information boards there is not much else to see. If it is cold, but you are desperate to get a shot with no other people maybe pack a picnic and you can nibble on some goodies in the car whilst you wait. The final tip on how to see the Dark Hedges without crowds is to arrive very late in the day. If you are not a morning person or would rather enjoy a leisurely breakfast or simply would prefer to drive up the coastline and back down the motorway, arriving late in the day at the Dark Hedges is probably the best option for you. Later on in the day, most of the tour buses will have gone back to Belfast. Claire from Past the Potholes managed to take some incredible photos late afternoon at the Dark Hedges. By saving the Dark Hedges till last you are more likely to be able to enjoy them without the crowds as most of the tourists will have headed back to their accommodation. Make sure you check what time sunset is so you do not miss the light though! Hope this post has helped inspire you that it is possible to take incredible photos and experience the Dark Hedges without the crowds. We certainly enjoyed seeing the eerie trees along the Bregagh Road. Do you have any tips for trying to avoid crowds at popular tourist spots? Let us know in the comments below! I’m a big fan of Game of Thrones and would love to visit. Thanks for the tips!